Yes, I know we all have to talk about staying 100% classy, but that game was against Phil Fulmer, and I don’t like the man. Nick Stephens, hats off to you for your toughness throughout the game. You’re the leader Tennessee needs. That was ugly, but an SEC win is always big. Stats are available at ESPN.com, but these numbers are all that matter: 7-0 (4-0 SEC), 45-9-2 against Ole Miss, 5 straight over the Rebs, and Saban moves to 6-1 against them fine Hoddy Toddy folks. 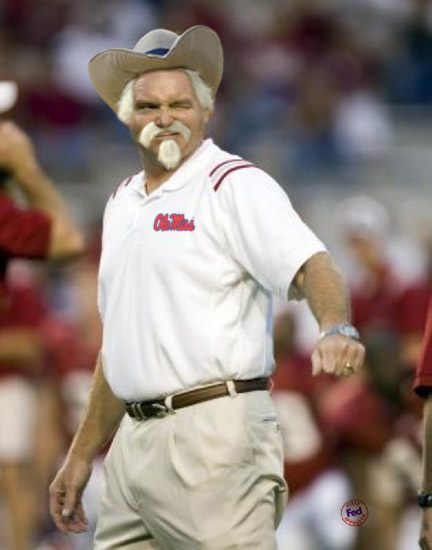 Congrats to Ole Miss and Houston Nutt for that comeback. I have to admit, even though we all like to have some fun at HN’s expense, I hate playing any team he fields. You’re always in for a tight game with that man on the other sideline. This game is really hard to get a hand on for a number of reasons. Both teams are coming off of bye weeks. Both bye weeks follow lackluster performances, which follow a week where both squads beat Top 5 teams on the road. Alabama is #2 in both polls, while Ole Miss has had an up and down season comparable to only the U.S. Stock Market. I could go on. But, as Houston Nutt would say during a boring movie, Let’s just skip to the funny part! Picture via Gate 21. No disrespect to HN of course. The Rebs don’t like it when other teams decided to actually pass the ball. They made Chris Smelley look like Peyton Manning, so we can only hope John Parker Wilson turns into Tom Brady. Alabama is coming off of a poor performance, but an SEC win nonetheless. A week off was needed due to a grueling schedule during the first half of the season. A fresh mentality should hopefully lead to a good victory for Bama. I know they are touting that Wild Rebel stuff, but this only shows that they cannot beat us if they line up and play standard, smash mouth SEC football. We have to force them to play our game, something we’ve been able to do pretty well during the first 6 games. Ole Miss beat Florida with some fortunate turnovers and some nice moves by McCluster. If we keep the football in our hands (lookin’ at you, Glen), then we should be fine. Our D-line is one of the best in the nation. They might try to trick us on these constant trick plays, but they surely can’t beat us up the gut. For some reason, Houston seems to get a lot going his way durin these types of games. I don’t know if he has a football version of the farmer’s almanac, but he certainly has a history of making big statements at just the right time. Of course, he’ll probably drop a few more SEC games due to an inconsistent coaching style, but he his a threat against ranked opponents. I still worry about Alabama’s Special Teams. Tiffin has missed a few big FGs, and we really seem to give up big returns on kick-offs and punt returns. If McCluster is allowed to return a Touchdown, we’re making it much harder than it needs to be. Ole Miss has had success against other team’s turnovers, and Glen Coffee had a few issues with that against Kentucky. Keep the ball in your hands please. Jevan Snead has a very good arm, and our Secondary and overall Pass D has given me moments of concern. If we are to have a breakdown on this side of the ball, it will be in this area. We don’t have enough deep talent to make up for early mistakes and a tired 1st string. We also need to keep our focus. If we lose our focus, hello 2007. Ole Miss can win this game is they come with more intensity than Alabama. If we’re evenly matched in that department, Bama will end up winning the game. We just have to stick to our assignments, play physical football, and keep our foots on the gas if given the opportunity. Ole Miss is very capable of covering the spread (around 13 points…. I think). Alabama should win, 27-17.
the Opelika-Auburn News say Tony Franklin has been fired? I’m no AU fan, but this is huge news anywhere for it to be 6 games into the season.